Unfortunately no info has been provided in relation to the department for which the job has been published. 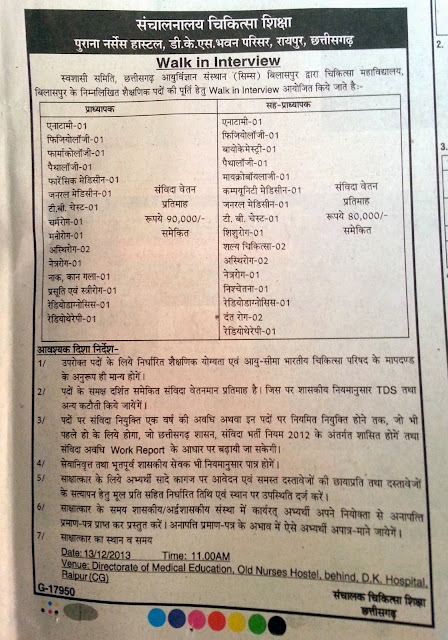 Recruitment on contract basis under National Rural Health Mission (NRHM) – Mobile Dental Clinic Project Applications in the prescribed form are invited to fill up the following posts on contract basis (on fixed salary) as shown against each category initially for a period of one year under the rules under National Rural Health Mission (Mobile Dental Clinic Project). Educational and Other qualification -BDS from the recognized University with one year experience from a recognized hospital/Institute. Pay:Rs.53,000/-(fixed p.m.) Age Limit : Age upto 35 years as on last date of submission ofapplication. Relaxation to SC/ST/OBC will be allowed as per rules. of their Admit Card & produce the same at the centre for written test.